The Moto Z Play is a well built smartphone with very good battery life, and that's what you buy this phone for. However, you will be compromising on speed with the Snapdragon 625 SoC. It's a good phone for those who don't want to compromise majorly on camera and battery life. Motorola’s choices for its smartphones are often baffling, but the company has dazzled us with innovation just as often. The Moto Z Play here is a combination of both. The Snapdragon 625 doesn’t have the brawn for a mid-range flagship, but the Moto Z Play definitely has the brains to fit the bill. The Moto Z Play is arguably one of the best phones out there in its segment, but not without issues. 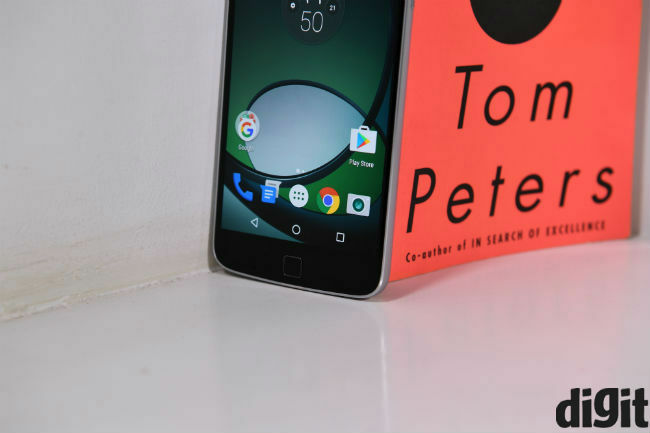 Here’s how the phone fared in our review. 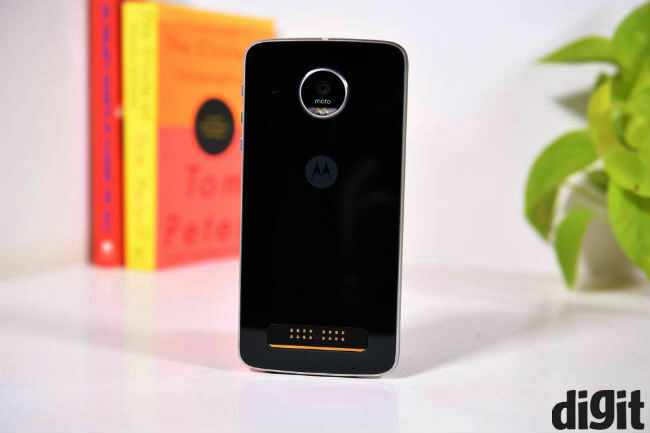 In essence, the Moto Z Play is a thicker version of the Moto Z, but with a glass back instead of metal. The magnetic connecting pins remain, to attach any of the Moto Mods, although the in-box style shell that comes with the Moto Z Play seems to wobble a bit. Further, the phone’s slightly chamfered edges and metal sides add a premium touch. This, when combined with the seamlessly designed glass body, makes for a pretty premium smartphone. The only hitch is in the fingerprints that the glass back attracts. This, however, is easily solved with the wooden style shell that Motorola provides in box. On the front there’s a flash and the camera, while Motorola’s square fingerprint sensor rests below the display alongside a noise cancellation mic. 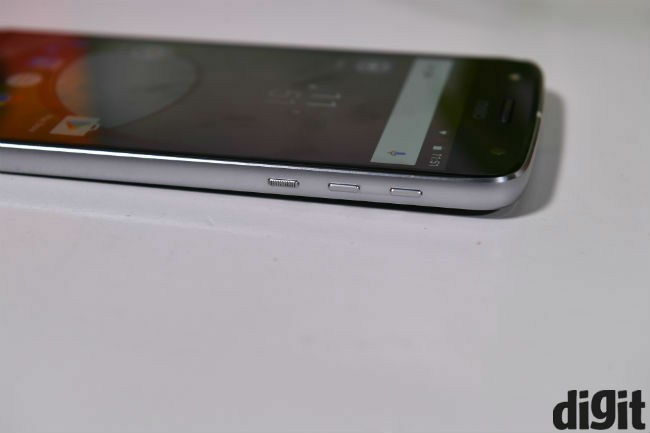 You’ll find the USB-C port and headphone jack (unlike the Moto Z) at the bottom, and the SIM/SD Card slots and a second mic is at the top of the device. From a build quality point of view, the Moto Z Play is a solidly built smartphone. With the style shells attached, the glass back is protected against shocks, and Motorola has presented a polished design that looks and feels unique. There’s also a Made in India logo at the bottom, and the phone is slightly heavy. 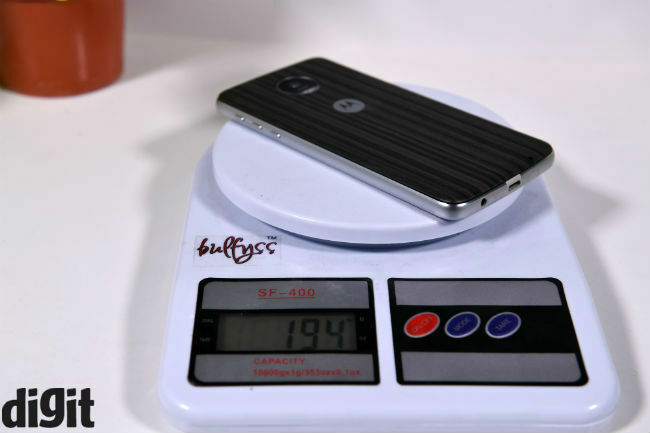 It weighs 165 grams without the style shell, and 194 grams with it. The JBL SoundBoost or Incipio battery mods take the weight beyond 200 grams, potentially making this one of the heaviest smartphones out there. The 1080p display on the Moto Z Play is one of the brightest in the sub-30k price segment. 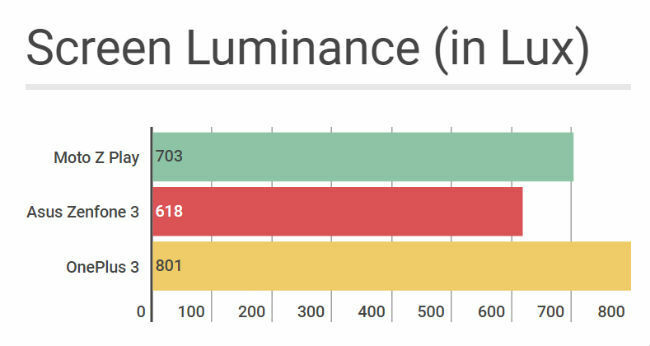 Its luminance reading of 703 Lux is the highest among our tested devices, surpassed only by the OnePlus 3. Motorola uses a Super AMOLED panel, which brings a yellowish tone on the display. However, the effect is quite subdued when compared to Samsung’s Super AMOLED panels. Colours look sharp and closer to source than most AMOLED displays. Combined with the brightness, you get a pleasant display to look at. The touch performance is also great. We found no ghost touches over a week’s usage. The choice of SoC on the Moto Z Play is arguable. 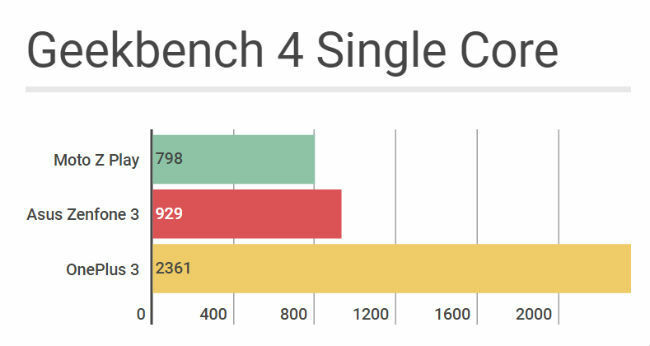 While most do not go for Snapdragon 820 processors, the Snapdragon 625 SoC has been quite weak in our experience. Motorola’s choice is, of course, to boost battery life. 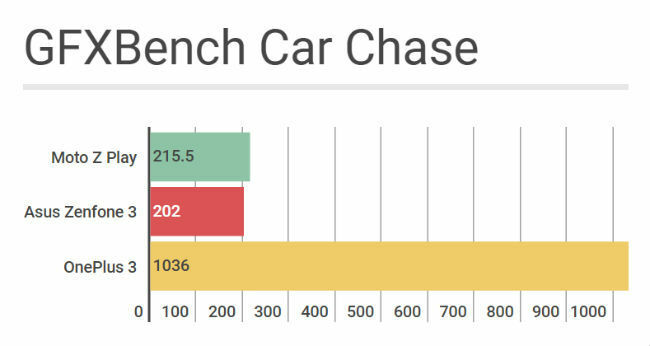 However, the trade-off on performance and speed could be a deal-breaker for some. That said, the company has optimised the performance to make the Moto Z Play an easier compromise than the Asus Zenfone 3. Combined with a good camera (which we shall talk about soon), the Moto Z Play presents faster real world performance than what benchmarks show. Day-to-day usage is snappy, which is something many phones with the SD625 SoC have lacked. Motorola allows clock speeds of 2GHz whenever necessary, and average clock speed remains between 1.4-1.6GHz. 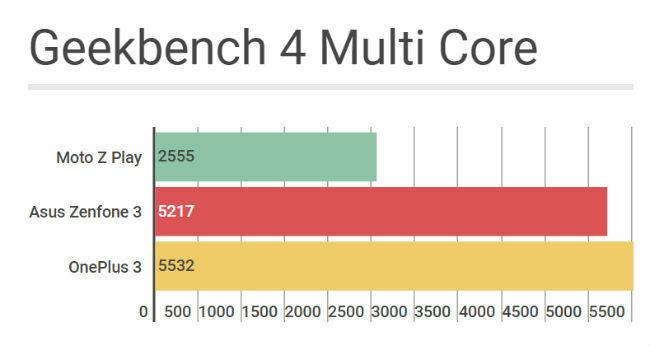 With 10-14% CPU load, the phone drops all the eight cores to 652 MHz. This isn’t very different from the Zenfone 3, which leads us to believe that the Moto Z Play’s performance is mostly driven by software optimisations. The stock Android interface, along with Motorola’s optimisations, generate higher frame rates on graphic-intensive games, and faster overall day-to-day performance. 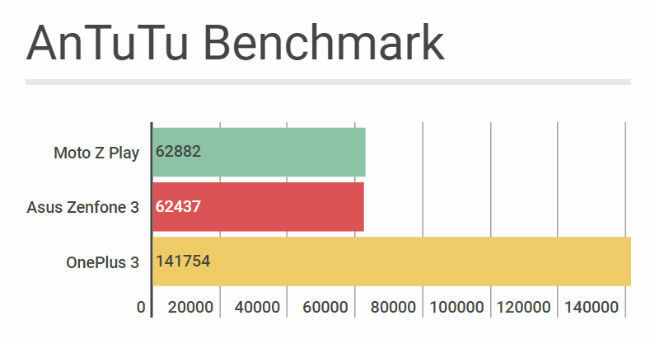 The background load on RAM and CPU are lesser, allowing better performance than competitors. That said, you’re still compromising a lot against the Snapdragon 820, and the phone’s 25k price point makes that difficult to justify. 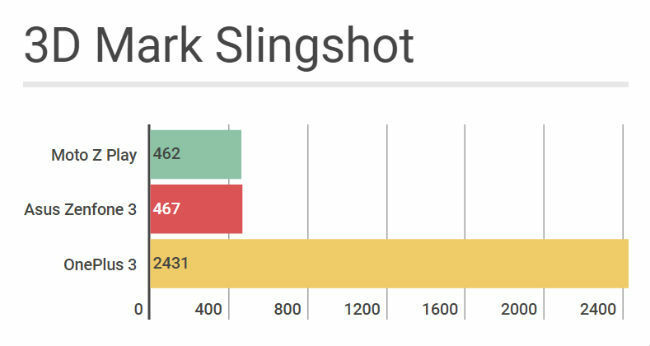 You can find a comparative performance analysis of the Moto Z Play here. That’s where 3510mAh battery comes in. The Moto Z Play is one of the best phones in the market in terms of battery life, period. For heavy users, the phone can provide about 16-18 hours of battery life. The Moto Z Play lasted us 18 hours with regular social networking, lots of IMs, gaming for about 30 minutes, and about 10-odd minutes of camera usage. That, in our experience, is very good battery life for a smartphone today. With lighter usage, the phone can easily surpass 24 hours, and with Incipio’s battery mods, you’re looking at the best battery life that a smartphone can provide today, without heavy compromises on features. If you’re not interested in its modular nature, the camera and battery are the two main reasons to consider the Moto Z Play. The phone has a 16MP camera with f/2.0 aperture lens, powered by the Omnivision OV16860 sensor and 1.3 micron pixel size. The camera is good under daylight and most well-lit conditions, but deteriorates drastically when shooting under low light. Under well-lit conditions, images show good details, and noise levels are kept under control. Colours are pretty well represented as well. However, noise levels rise substantially under low light, and details and sharpness are also compromised. The low light performance of the Moto Z Play is mediocre, at best. Overall, the Moto Z Play is still one of the better camera phones in its price range. The Snapdragon 625 SoC is slow, but Motorola’s optimisations have reduced load times for the camera app, and the clean interface is much appreciated. You also get a Pro mode, for more manual control over photographs. To sum up, the Moto Z Play is one of the better smartphones we’ve reviewed in 2016. While it does lack the speed that a phone in this price range should have these days, one has to appreciate its incredible battery life. The camera is also quite good, matched only by the Asus Zenfone 3. Given that the Moto Z Play is faster (in real world performance) than the Zenfone 3, we would recommend this to camera-centric users looking for a phone under 25k. However, if you want no compromise, the OnePlus 3 remains a much better smartphone on overall terms. Why motorola decrese MOTO G price?